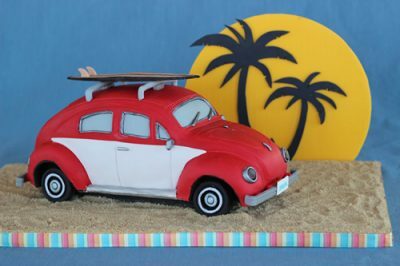 Summer may be coming to an end but it’s not over yet. There is still time to fit in a few more summer treats before we start roasting pumpkins and toasting pecans. 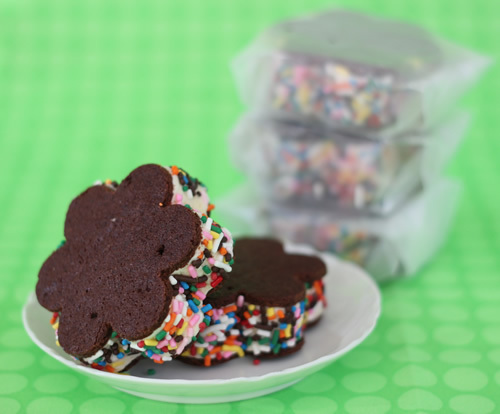 So I think it’s ok if I share with you a cool sweet treat that I know your kids are going to devour; homemade ice cream sandwiches. 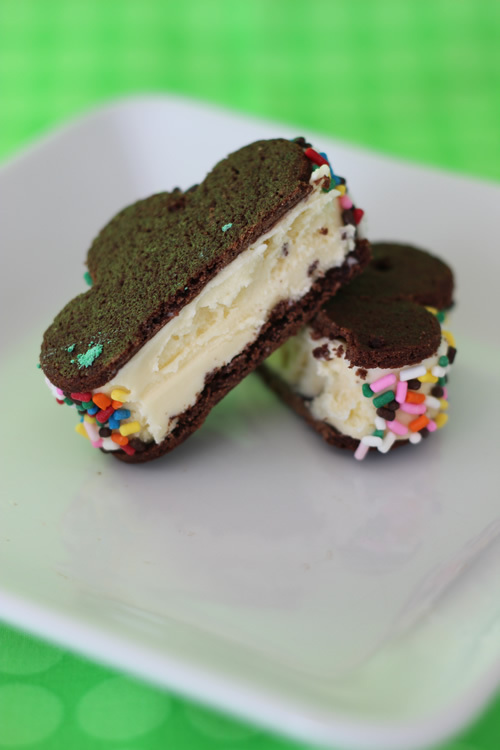 My kids have always loved ice cream sandwiches and I must admit that I am quite fond of them myself. 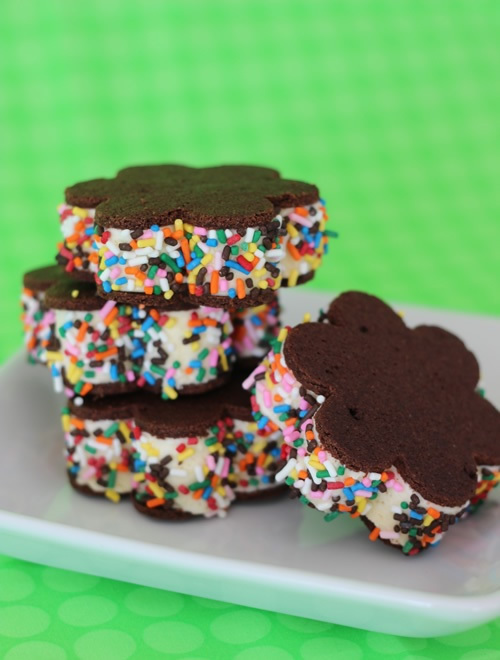 So when I invited some of my friends and their little ones over for a pool party, I thought ice cream sandwiches would be a great treat for everyone. Of course, being the obsessed baker that I am, I couldn’t just go to the store and buy a box of them. I was determined to create my own homemade version. Boy am I glad I did! They turned out wonderful. My husband and kids both agreed that they were the best ice cream sandwiches they have ever had. I ended up making several batches because I ran into some problems with the first few attempts. Fortunately, I was able to figure out solutions for those problems so you get the benefits from me doing all the trial and error work. But before I explain the process, here are a few more pictures of the chocolate and vanilla creamy goodness. Rectangles were just too boring of a shape for me so I went with the scalloped, flowery look. Of course you can make your sandwiches any shape you want. If you don’t make them square or rectangle, you just need a cutter that is the same size you want your sandwich to be. My scalloped sandwiches were about 3″ big. I added rainbow sprinkles to mine. Again, this is completely optional. 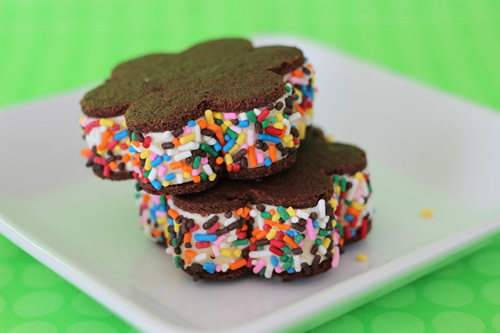 I loved the color the sprinkles added to the sandwich since you have to admit that ice cream sandwiches aren’t the most exciting looking treats. As you can see above, the sprinkles are only on the outsides, the inside is all pure vanilla ice cream. 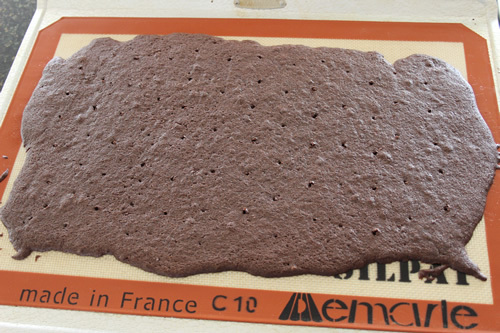 And take note of the even thickness throughout the chocolate cookie, I will talk more about that below. Ok, back to the instructions on how to make these little guys. I stared by spending more hours than I would like to admit looking up various recipes online. I finally settled upon a recipe I found at Instructables.com. I followed it exactly the first time. The flavor was incredible! It tasted very similar to a rich brownie. I did have a few problems with it though. First, I couldn’t get the chocolate cookies to maintain an even thickness from just spreading the batter with the spatula. This may not bother a lot of people but when I bite into an ice cream sandwich I want to get the exact same amount of chocolate cookie in each bite. Plus, the cookie slants if the shell is thicker on one side than the other. To solve this problem I ended up using my Perfection Strips and laid them down as a guide to maintain an even thickness when spreading the batter. Second, I had a few problems with large air bubbles developing in the batter while it baked, causing cracking on the finished baked cookie. After thinking through this one, I recalled that every ice cream sandwich I have ever purchased always has small holes evenly spaced throughout. I am not certain about this but I am guessing that is to prevent air bubbles from forming, just like when you poke a pie crust with a fork. I decided to add a step to the instructions and remove the baking sheet half way through the baking process and poke holes all over the partially baked cookie. It worked like a charm! No more air bubble problems. Third, as per the instructions, I cut out my shapes after the ice cream was already sandwiched in between the cookies. It didn’t work at all. The ice cream caused the cookie to flex and resulted in lots of cracking in the cookies as I pushed my cutter down through them. 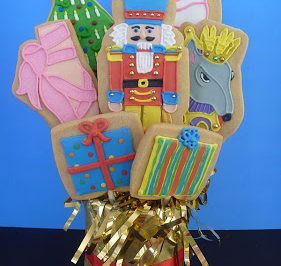 This may work just fine if you are just cutting out squares or rectangles but if you want a decorative shape the cookie needs to be on a hard surface and cut out before sandwiching it with the ice cream. Finally, since I had to cut the cookies out before filling them, I found that spreading the softened ice cream on the shaped cookies made an ugly mess. I wanted the ice cream to line up perfectly with the cookie. The only way I found to do this was to spread the softened ice cream into a baking dish, let it freeze back up then use the cutter to cut out ice cream shapes. 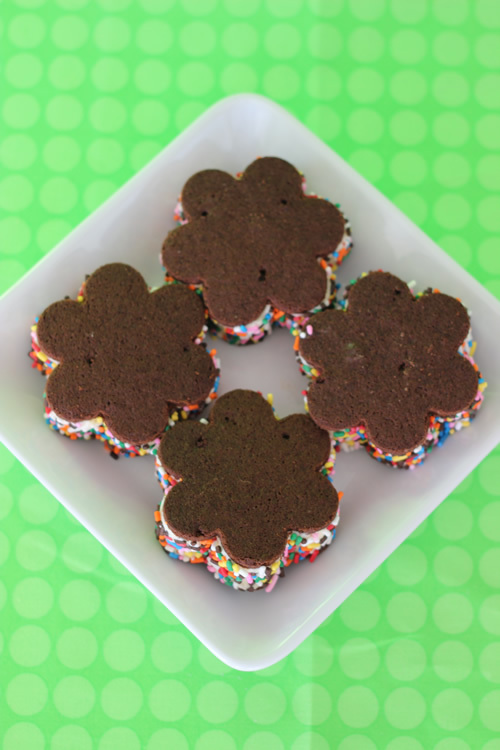 It was then easy to position them correctly in the cookies and create a perfectly shaped ice cream sandwich. So the following instructions are based on the recipe I found on Instructables.com but I have added some steps in to make the sandwich as perfect as possible. 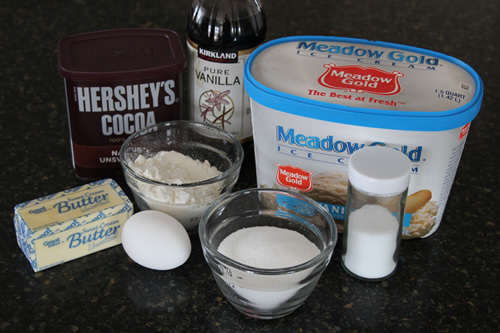 Click this link if you would like a printable version of the Homemade Ice Cream Sandwich recipe. 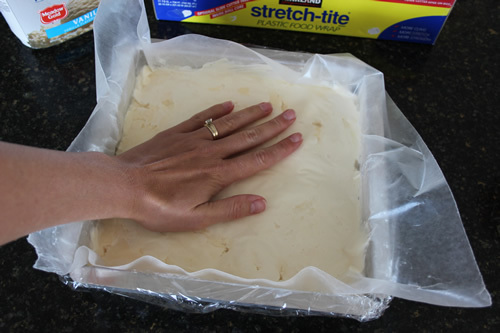 Preheat your oven to 350 degrees and line a baking sheet with parchment paper or a Silpat mat . 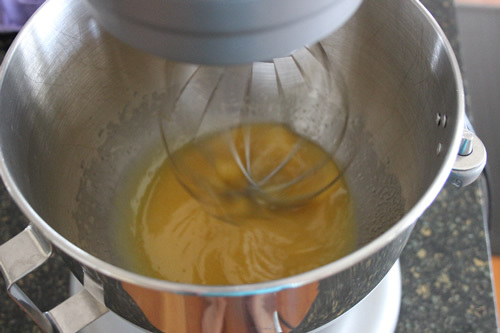 In the bowl of an electric mixer, whisk together the melted butter and sugar until well combined. Add the egg and vanilla and continue to whisk. 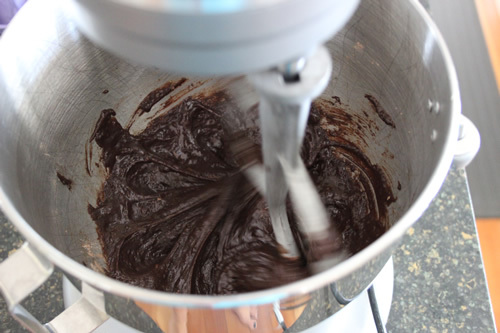 Add the flour, cocoa powder and salt and stir until combined and smooth. I switched the whisk out for the paddle in this step. 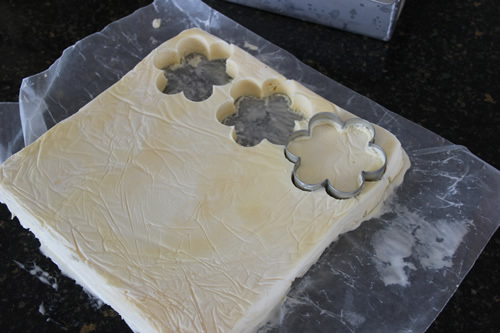 Pour the batter onto the prepared baking sheet and spread it evenly. Here is where I used my Perfection Strips to help get an even thickness. First I spread the batter with a spatula then I used a long metal ruler and drug it along the white slats to spread it out evenly. 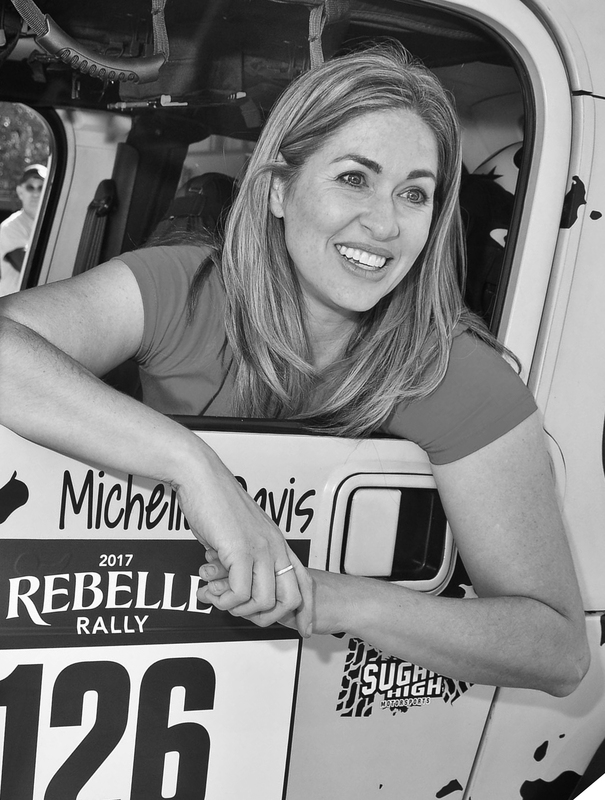 If you don’t have Perfection Strips you can use rulers (stack them if they are too thin) or any other type of slat that is approximately 1/8″ thick. 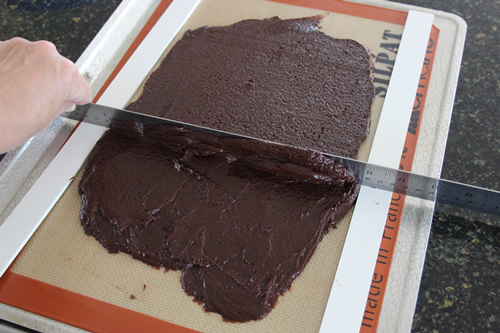 Or you can just free hand it and try to get the batter thickness as even as possible with an off-set spatula . Bake in a 350 degree preheated oven for a total of 10 minutes. 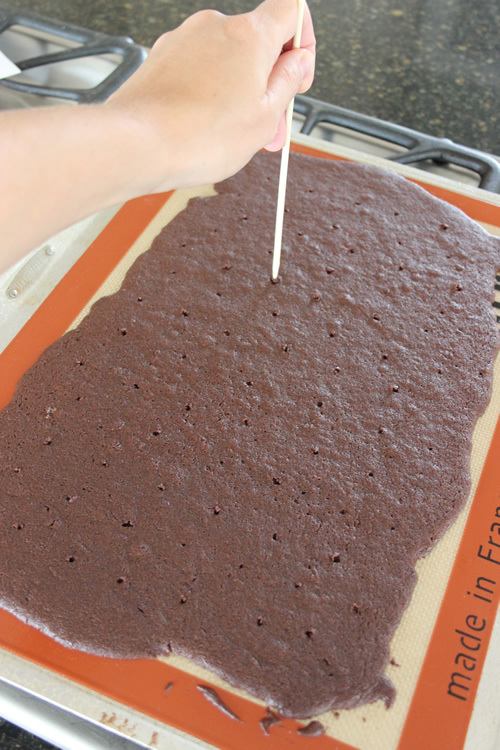 Remove from the oven half way through baking and use a skewer to evenly poke holes across the cookie to prevent air bubbles from forming. Rotate pan and return to oven for final 5 minutes of baking. It is done when it is dry to the touch. Place sheet on a wire rack to cool. 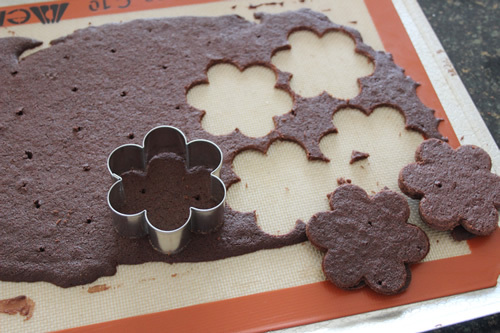 Once completely cooled, use a shaped cutter to cut out cookies. Be sure to cut out two cookies for each sandwich. If you are just going to do squares or rectangles then use a pizza cutter with a ruler as a guide. I used a cutter that was about 3 inches in diameter. I was able to cut out enough cookies to make 5 sandwiches from one batch. Your yield will vary depending on the size and shape of your cutters and the placement of your cutter on the cookie. 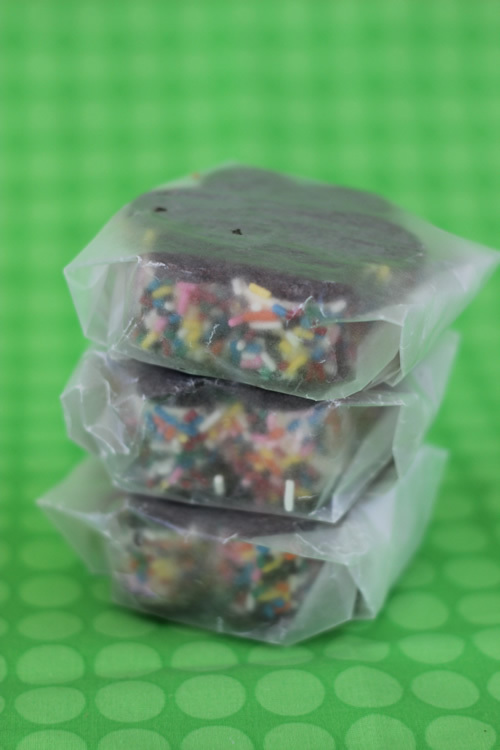 Cover cookies with plastic wrap until ready to use. Allow ice cream to soften then evenly spread it in a plastic wrap lined baking dish to a thickness of about ¾ to 1 inch thick. Place a piece of waxed paper on top and use your hand to firmly pack the ice cream and smooth it. Return to the freezer to allow to freeze solid again. 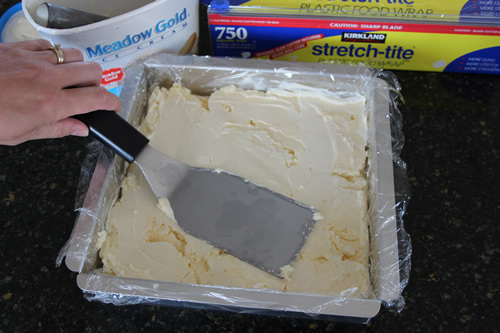 Remove the baking dish from the freezer and lift the ice cream slab out, turning it upside down. Remove the plastic wrap. I didn’t do this but I would recommend placing it on a cutting board so that you can easily place the cutting board back in the freezer if the ice cream starts melting on you too much while working with it. 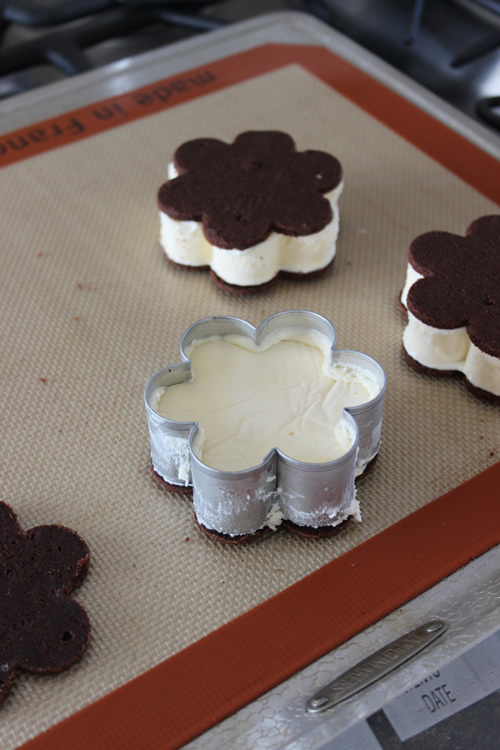 Use the same cutter you used for the cookies and cut out ice cream shapes. 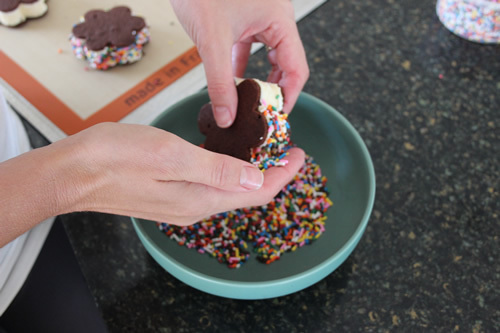 The ice cream will stick inside the cutter so lift the whole cutter onto a cookie (make sure the bottom cookies are turned upside down and the top ones right side up) and use your finger to hold the ice cream in place while sliding the cutter off. Be sure that the ice cream is lined up with the shape of the cookie. Place another cookie on the top of the ice cream. If you want to add some color to your sandwich, pour some rainbow sprinkles into a bowl and, holding the sandwich over the bowl, press sprinkles along the sides of the sandwich. You could also use chopped nuts or candy pieces for differing flavors. Return the sandwiches back to the freezer and allow to firm up for a couple of hours. Now it is time to eat! If you want to save the sandwiches for later you can wrap them in plastic wrap or waxed paper and stored in the freezer for up to one week. Enjoy the sandwiches and enjoy the last few days of summer heat; fall is on it’s way. Those are great! Can’t wait to try them! Thank you Magda! I hope you get a chance to make them. We loved them. Thanks for dropping by my blog.